Photos were taken from the Premium Rose Parade Seats YOU'LL be sitting in! Read what our clients have to say about this rally! Join us for the spectacular Rose Parade RV Rally in Pasadena, CA! while saving you money and getting you the best premium seats offered by Sharp Seating! This year's theme is: "Making a Difference"! We hope you'll join us and be inspired by this adventure of a lifetime! Experience: 36 years of providing our Guests with the very best of the Rose Parade. Best Seats, Best Location, Best Events and the Best Most Experienced Staff. Location: We set up an RV Parking area at Santa Anita Racetrack in Arcadia, California. Our parking area is inside gate 6 of Santa Anita Racetrack on blacktop. We bring in Studio Quiet generators to provide good solid 30 Amp power for everyone. Facilities: We set up a 40’ by 120’ main tent with a 30’ by 30’ serving area for our catered meals and a 20’ by 40’ kitchen tent for our caterer’s use. We have propane tent heaters to take off the chill on the early mornings. Enough tables and chairs for everyone and the coffee is ready by 6 AM each morning. Two 60” TV’s in the tent provide key entertainment and allow us to watch the Ball drop in New York City during our New Year’s Eve Party. 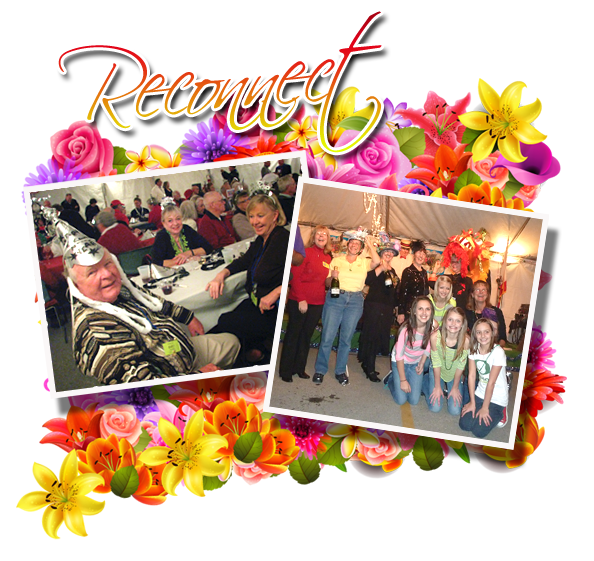 Staff: Our Volunteer RV Staff are the most experienced you will find and boast a combined 50 Rose Parade celebrations. They are always available to answer questions and help you put that check mark on your “Bucket List”. Rose Parade Seats: We have some of the best premium seats on the Parade route. We are very close to the start of the parade just as the route crosses St. John Street. Our seats are on the East side of the road so the sun comes up behind us making for great pictures. Our seats are also only 11 rows high and right on the blue line. The Blue line is the edge of the road for the bands and floats. It means we don’t have anyone sitting in front of us and we are able to talk with the people on the floats as they go by. The biggest complaint we receive about our seats is that they can’t get the entire float into their picture. Transportation: We use Coaches with bathrooms for transportation to all of our events. We have experienced staff that know the routes and the best way to get through the traffic during this very busy week in Pasadena. That means we spend a lot less time on the bus and more time enjoying all of the activities. Rally Cost: Because we are an all-Volunteer Non-Profit Organization our costs are significantly less than commercial companies. Our goal is to provide the best rally possible at the lowest cost and to fund the basic expenses to keep SOI RV Club active. We encourage you to compare our events and costs for the Rose Parade with any other group and we think you will be pleasantly surprised with our program. Day at the Races: If you have not been to Santa Anita Racetrack before, you are in for a treat. The FrontRunner Restaurant is one of the best ways to experience the excitement of a “Day at the Races”. Sitting above the track with a panorama of the San Gabriel Mountains as the backdrop, the FrontRunner truly leaves you on top of the world with a great view of our rigs across the track. Air conditioned comfort while enjoying your meal and separate betting windows for your winning picks make this a special, not to be missed event. New Year’s Eve Party: The tent will be decorated with lights and noise makers for our celebration bringing in the New Year. The Crown City Dixieland 10-piece Band will be playing for your enjoyment, culminating with the dropping of the Ball in Times Square at midnight Eastern time. We will have a traditional meal served in the tent and you won’t want to miss the Crazy Hat Contest. Lot’s of fun and plenty of prizes. Decorate the Sierra Madre Float! There is never a dull moment at SOI's Rose Parade RV Rally! With delicious meals, talented entertainment, and day tours, you are sure to have lots of laughs and memories to take home. Meet new friends and reconnect with old ones right from the comfort of your motorhome. SOI Club maintains a full-refund policy for all reservations cancelled 7 days or more prior to the trip start date. Cancelled reservations may be subject to a $75 processing fee or the actual cost of nonrefundable events already paid. A reservation cannot be canceled after a trip’s scheduled start date.